is at the midway point. 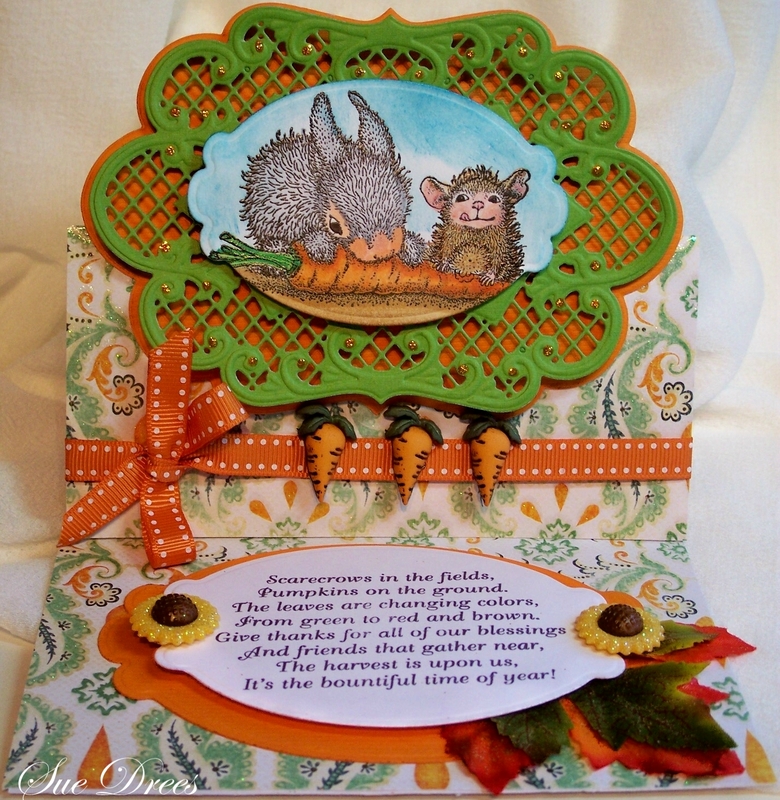 You have until October 6th at midnight to enter a card made with a House Mouse, Gruffie or Happy Hopper Stamp. The die cut is Creatables. Ribbon is a gift from America! Carrot buttons from my stash bought at a show years ago. The sunflowers were a gift from my friend Cathy, thanks! Leaves from my stash. Sentiment was sent by a friend, sorry don't know whose stamp it is. Papers are My Mind's Eye. Die cut is Spellbinders. Hope you have time to join us at the House Mouse and Friends Monday Challenge. There is a $25 Gift card to the House Mouse Designs website for the prize for one lucky winner. Love to see what you come up with. 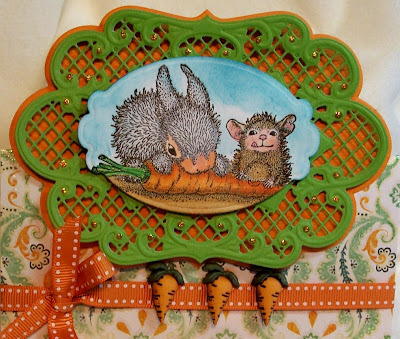 Wow Sue these colours are amazing great use of the die shapes..& these cute friends sharing their carrot awwww. I love the great sentiment too. Super cute, Sue. I love that Creatables die and your little gems. Those carrot buttons and your sunflowers really add something to this already adorable image. So it's your birthday, huh? I wish you a very happy birthday. I'll bet as a birthday gift to you Keeya will be the best student in class this week. LOL Enjoy the week. This is stunning Sue. I love the sweet image, the wonderful verse and gorgeous colours too!! Happy Birthday from me too!! What a beautiful card Sue. wow beautiful card also you card under Sue. I can't sing like Christine, but a Very Happy Birthday! The buttons and die cuts have made this creation a mousy masterpiece! Love everything about it, Sue! Happy belated Birthday Sue! hope you had a grand time of it. Love your card, the design is fantastic, so much to look at and admire, wonderfully done! 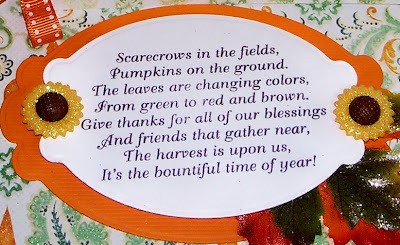 Love this Autumn/Harvest creation, fabulous image. Gorgeous colouring and paper too. Awww Sue this is adorable. What a sweet image and perfect colours. I love the embellishments you have used. Well Happy Belated Birthday Sue! Hope it was spectacular. I just caught up on all the post I missed in the past week and one half. I love to see what you come up with all the time. You have found some stunning die cuts, but your Stamp Scape's card is over the top gorgeous. How CUTE! I love that little mouse licking his chops - it's just adorable! LOVE the diecut and carrot buttons too! I hope you had a wonderful birthday celebration!